It you are planning to travel to Liguria by train, you will find that there are very good railway links throughout Liguria making exloring this enchanting region a very pleasant and easy experience. The Ventimiglia - La Spezia line services travellers of Northern Italy. 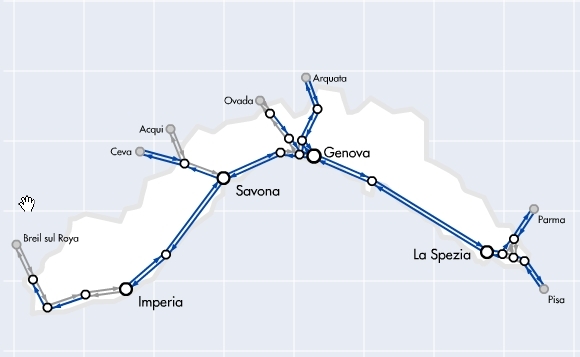 The Savona - Genoa route connects Liguria with passengers coming from Turin direction. and from Parma on the La Spezia route, which then converges on the Tyrrhenian line to Rome, Naples and Southern Italy. The regional rail network offers conveniently timed connections to all destinations in Liguria making traveling to Liguria by train a pleasant and convenient way to explore the region. Liguria is also connected by the main railway lines on international routes from Nice , Mont Cenis, Gothard, Germany, Austria and Eastern Europe. The regional trains are also the recommended way of transport when visiting the National Park of Cinque Terre. It is possible to approach the villages of Cinque Terre by car, but there is no use for a car once you are there as the Cinque Terre historical centres are closed to car traffic. For further information and details , please visit our dedicated Cinque Terre Travel Resources section. For further information on purchasing tickets, timetables and routes, visit Ferrovie dello Stato portal. While you can check real time train travel info at the new service Viaggiatreno just by clicking on the desired route.